Dutch Schultz: "If I didn't like you, you'd be dead. You understand that?" Huh? Dixie Dwyer: "Sure I understand that. It's nice to be liked." 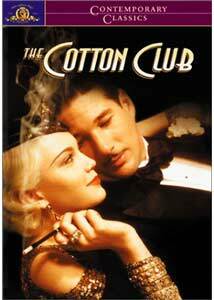 After a number of legendary disasters, Francis Ford Coppola began his long comeback with this homage to the 1930s' gangster film and the movie musical, The Cotton Club. Using parallel stories of a white trumpet player and a black tap dancer, Coppola (for some reason dropping the Ford) sets them off against the music of the late 1920s and early 1930s and the world of the mob as it makes the transition from the Jewish and Irish ganglords to the Italians, represented here by Charles 'Lucky' Luciano (Joe Dallesandro). Michael 'Dixie' Dwyer (Richard Gere) is a jazz cornetist on the rise. He happens to be talking to ganglord Dutch Schultz (James Remar) and saves him from a bomb, without knowing who he is. Schultz takes him on as his personal musician, which is a two-edged sword. He is surrounded by wealth, money and power, but he's also little better than a lackey. On the strength of Dixie's association, younger brother Vince Dwyer (Nicolas Cage) finagles himself a job as a numbers runner and killer for Schultz. Sandman Williams (Gregory Hines) and his brother Clay (Maurice Hines) are making a stab at the big time at the Cotton Club, a whites-only jazz club in Harlem with black musicians, run by kingpin Owney Madden (Bob Hoskins). In the background is a mob war between Schultz and the black gangs, which opens the opportunity for the Sicilians to make their move. While the story is a little on the melodramatic side, the music makes it all worthwhile. From the opening moments, with the singing cornet (Gere played his own solos) and wailing clarinet, you know that this is going to be a hot two hours. It's really a musical, but as was the case in Cabaret, the use of a nightclub makes the songs seem effortless. The one exception is a scene at the Hoofers' Club, where the tap dancers do a challenge to show off for Sandman's prospective girl, Lea (Lonette McKee). This bit is overly long and seems quite forced. Omitting it wouldn't have hurt the film at all, though it will certainly be a highlight for tap fans. John Barry gets credit for the original score, and while he nicely captures the air of the period, he also knows enough to get out of the way of the real thing. The undercurrent of violence is constant, though it only surfaces on occasion. But when it does surface, it does so brutally and viciously, such as the moment when Schultz murders rival Flynn with a fork in the throat, a moment just as shocking as DeNiro's baseball exploits in The Untouchables. The mob scenes smack of authenticity, no doubt due to the input of Godfather scribe Mario Puzo. Of course, you can't have a musical with romance, and there are parallel romances: Sandman and the unwilling and passing-for-white Lea, and Dixie and Schultz's moll Vera Cicero (Diane Lane). Although McKee isn't terribly interesting, Lane really sparkles as the cynical and greedy Vera. The cast is quite noteworthy. Though Gere is his usual stiff self, it is nice to know that it's actually him playing; when he's playing the piano, he's really playing that too, which gives me a whole new appreciation for one of my least favorite actors. Hines is all right, but the real stars are the mob figures, who are highly enjoyable. Hoskins is a malevolent force that is always under control but vicious through and through. Ramer makes an excellent and psychopathic Schultz, but the best performance goes to Julian Beck, as the incredibly creepy hitman Sol Weinstein. Whenever he's on screen, he's utterly fascinating in the same way as a chamber of horrors. Nicolas Cage is better and livelier than usual as the misguided little brother who gets in seriously hot water with the mob. The script is full of great lines, and really sparkles with character. I must have had a dozen candidates for the quote (usually the hardest part of these reviews) before finally settling on the one above. The combination of mobsters and music is quite entertaining, and this movie is highly recommended. Image Transfer Review: This film must be a compressionist's nightmare. The interiors are all smoky and hazy, the exteriors are mostly rainly and foggy, and the whole thing is very, very dark. Yet MGM comes through with flying colors, giving us a superb, detailed transfer that doesn't have any notable compression artifacts at all. Colors are good and black levels and shadow detail are excellent. Some of the onstage scenes are reddish, but this is clearly in intentional lighting decision; background elements are correctly colored. This is a superb rendition of a picture from the 1980s, an era notorious for crappy film stock. Audio Transfer Review: Like the video transfer, the 5.1 DD sound is excellent. There is good ambient sound, the music has excellent range and depth, and dialogue is always clear (a good thing, since MGM is still not including English subtitles). Hiss and noise are not audible. Everything sounds great here, which is very pleasing given the importance of the music to the enjoyment of the film. Extras Review: Other than an anamorphically enhanced trailer, there's nothing. A superb period piece, flawlessly matching mob violence and the music of the early 1930s. A terrific transfer makes this a must-buy, even though there's nothing but a trailer for extras.